Nadeo's TrackMania franchise is beloved by PC racing junkies for merging a general simulation approach with looping, rollercoaster-esque course design and the ability to easily craft your own tracks from tiny segments. TrackMania DS marks the first non-PC iteration for the series, and while it retains all the aforementioned design pillars, the resulting experience somehow filters out the thrills and excitement that made it worth bringing to a wider audience in the first place. It's not for a lack of content or features, however - TrackMania DS encompasses a variety of play styles and offers quite a bit to do (or create). Its primary racing style is that of time trial events against three ghost racers, each of which serves as a benchmark for winning a gold, silver, or bronze medal. Starting at the Practice level, you'll race against the clock, using earned medals to unlock additional races on the Easy, Medium, Hard, and Extreme difficulty levels. 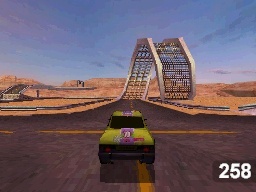 Just three environments are available in the game (stadium, desert, and rally), with one specific car designated for each type of race. Successful racing in TrackMania DS requires a meticulous level of detail, as many races can be completed in 15 seconds or less, with multi-lap jaunts even topping out at less than two minutes in total. While the rally courses are pretty standard fare - winding dirt paths amidst the nondescript countryside - the stadium and desert tracks both take place upon suspended platforms that allow for all sorts of jumps, obstacles, and potentially unpleasant outcomes. Did you ever put together loop-de-loops and other "extreme" track layouts for toy cars as a kid? TrackMania DS sort of hits on that nerve, though the lack of typical track design constraints means some course elements may seem convoluted or oddly placed. Considering all that, it's little surprise that TrackMania DS is a pretty difficult game. Despite the large preponderance of casual Nintendo DS users, TrackMania is (and continues to be) a series targeted at racing nuts willing to devote the time and effort to beating their own times and continually honing their skills. Dividing the race events amongst multiple difficulty levels gives even newcomers a fair amount of content to access within a short amount of time, but unless you're particularly skilled, chances are accessing the highest difficulty tiers will remain a mere pipe dream. As noted earlier, TrackMania DS offers more than simple time trial races, though the alternative options veer well outside traditional racing archetypes. Platform mode, for example, outfits each track with a variety of hazards (massive pot holes, sets of pillars) and tasks you with reaching the finish with as few checkpoint restarts as possible. Puzzle mode is as much about the racing as it is creating the track, integrating the course editor in challenges that offer a limited amount of pieces with which to create a path from start to finish. While Platform offers a decent diversion, creating tracks with selected pieces and designated connection points zaps most of the fun out of the building process, leaving Puzzle a fairly limp offering. At best, it serves as a decent introduction to the separate Editor mode, which is where the standard track creation goes down. Dragging and dropping segments to build your fantasy racetrack is simple enough, and you can use the stylus to draw a basic path and then expand upon it as desired. Additional pieces can be purchased using coppers earned in the other modes, but despite the robust nature of the editor, the lack of Wi-Fi support largely kills whatever long-term appeal such a mode should hold. Sure, you can tear up the tracks via local four-player modes and a one-system multiplayer hot seat option, but the inability to share your creations with the greater online populace limits the incentive to devote so much time to perfecting your dream course. Developer Firebrand Games has helmed several DS racing games in the past (including well-received titles Race Driver: Create and Race and GRID), so it's little surprise that TrackMania DS runs well and looks sharp on the platform. The nuts and bolts are all here - nearly every aspect of the game is competently executed - but it all comes across so cold and mechanical. Maybe that's intentional, but in light of flashier franchise offerings on the Nintendo DS, it's hard to believe TrackMania will make many waves with this merely adequate portable debut. Bottom Line: TrackMania DS loses quite a bit (excitement, online functionality) in translation. Recommendation: If custom-designing tracks and racing against the clock is your thing, give it a spin. Otherwise, TrackMania DS likely won't keep your attention for long. Andrew Hayward found a crack on his DS Lite hinge during the review process. Oh no!